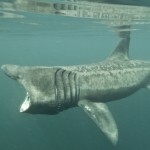 Being a swimmer, and encountering a four-meter-long Basking shark with a wide open mouth, must be scary as can be. This happened to a swimmer last week, during his swim off the coast of Zandvoort, The Netherlands. The second largest fish in the world is rarely observed for the Dutch coast. In 2009 washed ashore on the beach of Ameland a cadaver of a Basking shark. Basking sharks (Cetorhinus maximus) is the second-largest living fish, after the whale shark, and one of three plankton-eating sharks besides the whale shark and megamouth shark. They are found in all oceans of the world with a temperate climate and can be ten feet long. It is a cosmopolitan migratory species, found in all the world’s temperate oceans. Adults typically reach 6-8 m (20-26 ft.) in length. Although the shark usually swims around with wide open mouth, there is no reason to fear: the fish is toothless and only eats large amounts of plankton from the water. It is a slow-moving filter feeder and has anatomical adaptations for filter feeding, such as a greatly enlarged mouth and highly developed gill rakers. Its snout is conical and the gill slits extend around the top and bottom of its head. The gill rakers, dark and bristle-like, are used to catch plankton as water filters through the mouth and over the gills. It is tolerant of boats and divers approaching it, and may even circle divers, making it an important draw for dive tourism in areas where it is common. Like other large sharks this animal is classified as an endangered species due to over-fishing and high demand for shark meat- and organs, however it is fished mainly for its fins (for shark fin soup). Parts (such as cartilage) are also used in traditional Chinese medicine and as an aphrodisiac in Japan, further adding to demand. 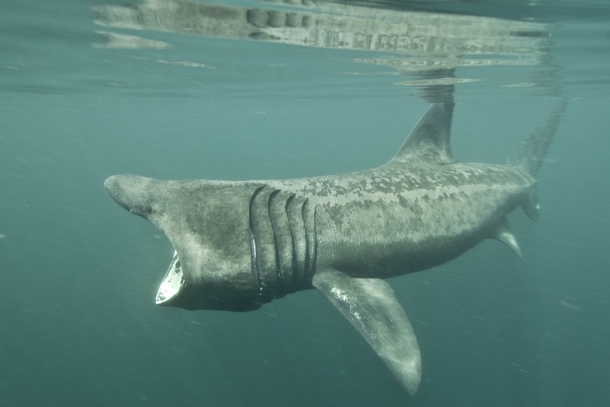 As a result of rapidly declining numbers, the basking shark has been protected in some territorial waters and trade in its products is restricted in many countries under CITES. It is fully protected in the UK, Malta, New Zealand, Florida and USA Gulf, and since 2008, it is subject to a target fishing and landed bycatch ban within EU waters.